It’s become increasingly obvious that diets usually don’t work for weight loss in the long term. Here we take a look at some popular diets and why they are doomed to fail. Low fat high carb In theory, this diet makes sense- fat has higher calories per gram than carbohydrates or protein, and saturated fat is linked to heart disease so reducing this should be great for your health. The issue is that high carbohydrate diets stimulate the release of higher levels of insulin, which is a hormone that stimulates fat storage. Studies have also shown that if we think a food or drink is low fat, we will consume bigger portions of it. Low carb high fat Also known as the Atkins diet, low carb high protein/fat diets leave you with less hunger, and stimulate less insulin to be released, and do make you lose weight quickly. You eat unlimited protein and fat, but cut out carbs. No calorie counting? Sounds good right? What you may not know is that a large amount of the weight loss that happens is water and muscle mass loss- reducing your resting metabolism long term. A long list of side effects accompany this type of diet, including constipation, headache, irritability, and nausea. Plus- who could sustain this diet long term? You stop, then gain it all back plus some. Gluten free Gluten avoidance is important for those with Coeliac disease or gluten sensitivities, but if you are staying away from gluten because you think that’s healthier, or think you’ll lose weight by doing so, you’re on the wrong track. Gluten free products often have extra fat/sugar to make palatable, and weight gain can occur if instead of replacing gluten with whole grain alternatives you are instead choosing more processed foods. Dairy free If milk gives causes bloating and cramping pain, lactose intolerance is a prime suspect, and a good reason to find dairy free alternatives. Avoiding dairy for weight loss however has conflicting results, with some studies showing weight loss- possibly from reduced calories from eliminating high calorie dairy like cheese, cream, sweet full fat yoghurts- and others showing dairy in fact aids in weight loss. Nut or rice milks often have inadequate calcium, protein, and other nutrients, so aren’t a true replacement for dairy. Extra supplementation may be necessary. If weight loss is your goal, a bigger picture approach will probably bring you more success than cutting out one food group. Meat free Vegetarian diets are often thought to be much healthier, lower in fat, lower in calories, but it takes a lot of planning and preparation to ensure meat is replaced correctly. Iron is one nutrient that you would need to pay attention to. In terms of calories, a 100g steak has around 270 calories, and 1 cup of lentils has 230 calories, so vegetarian option don’t always have significantly less calories. Plus you can eat a 100% vegetarian diet that is still full of lots of unhealthy foods (e.g. hot chips). Grain free paleo The idea is that our digestive systems haven’t evolved enough for grains in our diet, and work better on foods from our hunter gatherer times. A positive is that this excludes a lot of unhealthy processed foods, but lots of unhealthy high calorie foods made without grains (paleo brownies anyone?). Nuts and dried fruit and particularly calorie dense. What works? Rather than excluding any particular food, food group, or energy source, it really does come down to the understanding that all food have their place in our diet for weight loss. There are no “bad” foods. Some things we should have lots of, such as non-starchy vegetables and water. 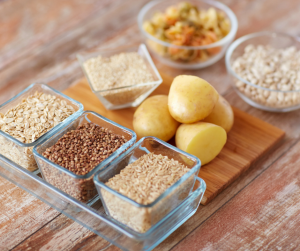 Some things we should have moderate amounts of, such as wholegrains, low fat dairy, fruit, starchy vegetables, and meat/chicken/fish/legumes/nuts. Some things we should have in small amounts just occasionally- like chocolate. Excluding actual food intolerances, everything in moderation, healthy fresh whole foods, the right portions and good variety, regular physical activity, plus the right knowledge about how our minds work with our bodies and eating behaviours. That’s the true secret to long term weight loss.